If you have lived in your home for more than a few years you are probably familiar with just about every inch of your property inside and out. That means if you heat and cool your home with a convenient HVAC system you realize by now that you have a large component of it in your basement that controls the heat and another large part of it outside that helps cool your home. Many people know that it’s good to get a tune up every once in a while on the inside furnace but fail to do any type of routine maintenance on the outside air conditioning condenser unit. Here are some things you should do to keep your condenser unit running well. Before starting you are going to need a few things to get the work done. You will either own these things already, have to purchase them or have to borrow them from a neighbor. 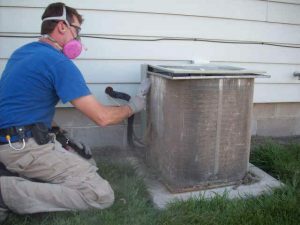 They are all necessary to get your condenser maintenance done properly. This list includes having grass shears, AC coil cleaner, a soft bristle brush, a level, a shovel and a pry bar handy to get the job done. There are two things that your AC unit needs in order to produce cool air to send into your home. They are the refrigerant that is pressurized in the system and air. Your condenser needs a tremendous amount of air to produce cold air and that is why it is located outside your home. So it is ultra-important that nothing is blocking the airflow to the unit. Things such as weeds, tall grasses and other greenery need to be trimmed well back from the unit so they do not restrict the air flow to the condenser. Overhead tree branches should also be trimmed back and be sure never to stack anything such as wood, compost or any other things so close to your condenser that they block airflow to it. In order to clean your condenser you will need to go to a local HVAC supply place and pick up some cleanser that is specifically designed for AC units. Apply this liberally to the exposed areas of your condenser. Rinse the special cleanser off with water just trickling out of a garden hose; never use a high pressure sprayer because it could damage some of the more delicate parts such as the aluminum fins. To clean the fins they make a special fin comb which you can also purchase at your local HVAC supply place. Bad things can happen to your condenser if the concrete pad it sits on is not level too. You can pry it up a little and push some gravel underneath it to get it level again. Use the carpenter’s level to make sure it is level on all four sides. These steps are pretty simple to do once you have cleaned the unit once or twice and become familiar with them.